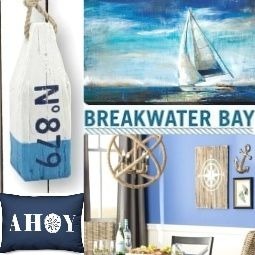 Awesome and creative garden planter ideas with a coastal and nautical theme. 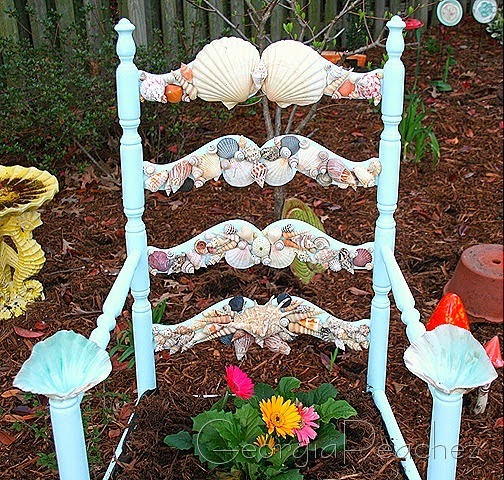 Who would have thought that a chair makes such a fabulous garden planter, especially when embellished with seashells found on the beach. 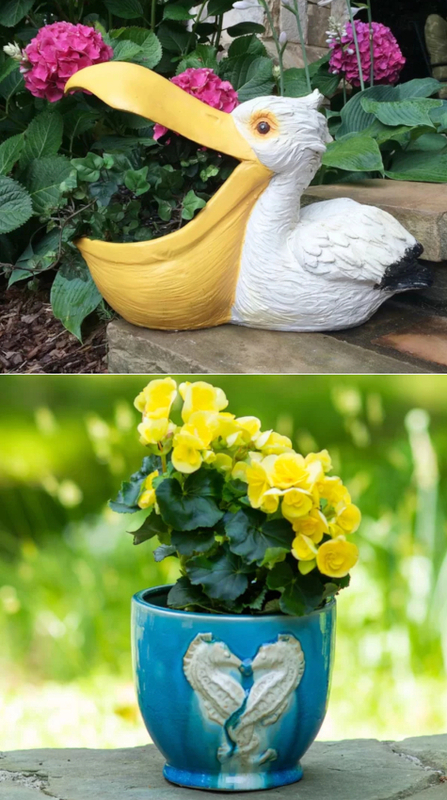 Featured on DIY Garden Ideas. 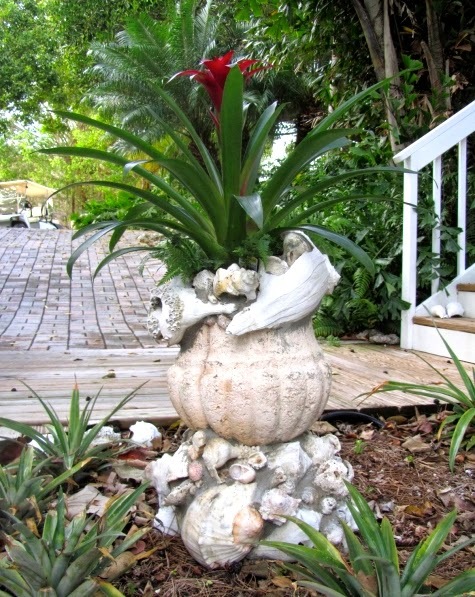 A broken Concrete Urn was repaired with large shells. 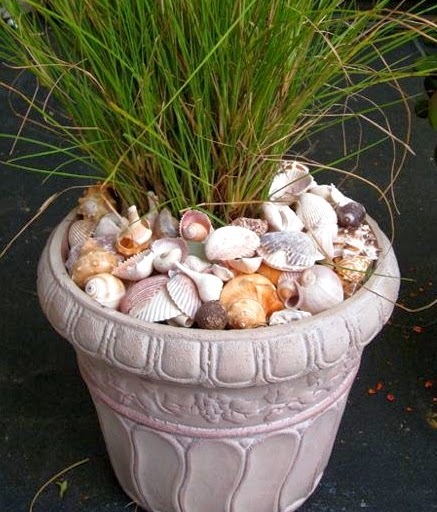 Now it's a fabulous seashell planter that welcomes you by the entry. 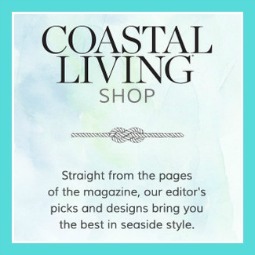 Featured here. 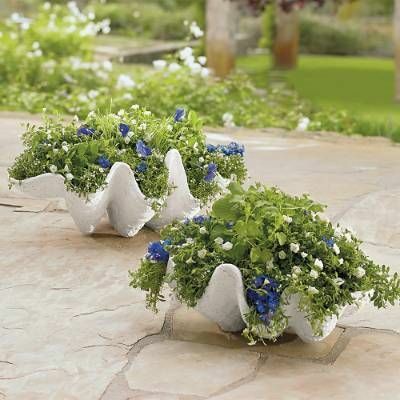 Clam Shell Planters at Home Depot for outdoors or inside. 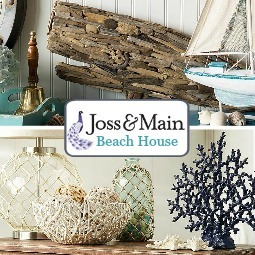 Beautiful Seashell Mulch by Edenmakers. 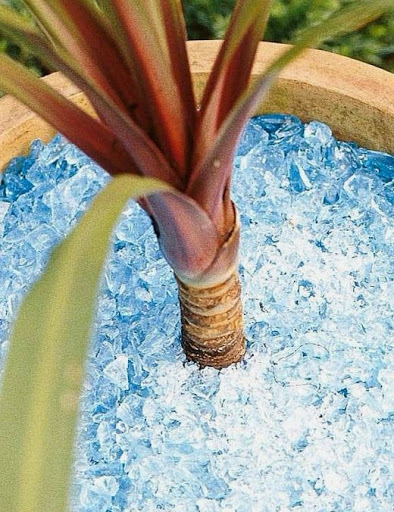 Get some oceanic sparkle with Blue Glass Mulch. 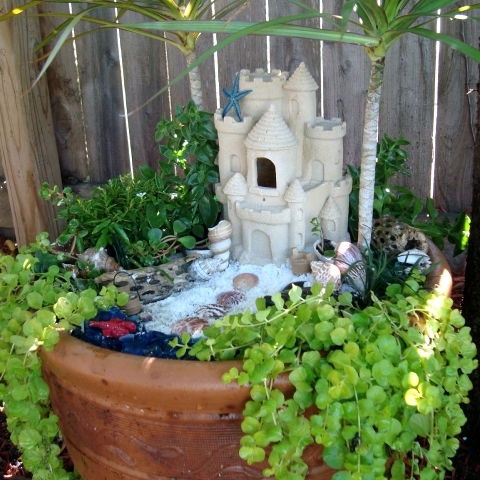 All kinds of fun Miniature Garden Ideas in Pots. 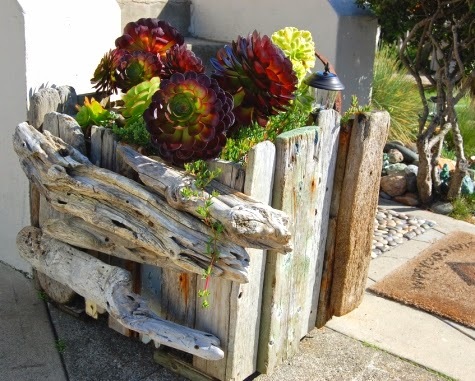 Cool Driftwood Garden Planters by Far Out Flora. 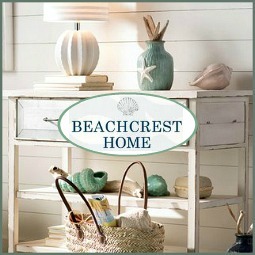 Decorated Terra Cotta Pots by House by Hoff This version is best for a covered porch. 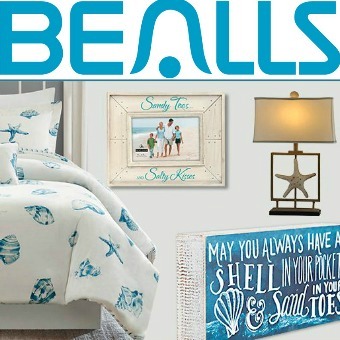 Flip flops are not just for walkin'. 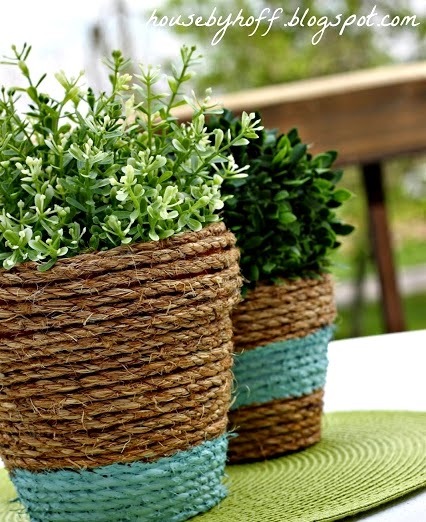 You can use them to hold small planters. 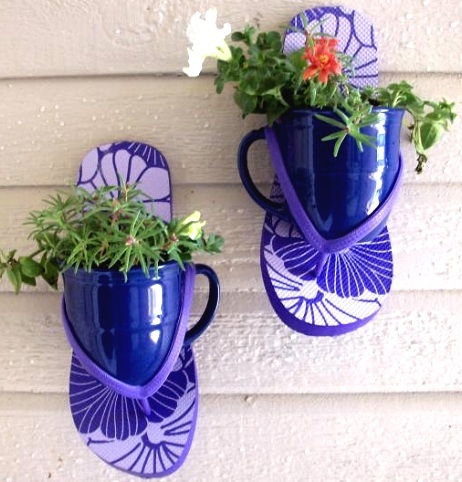 A whole row of flip flop planters would look quite stunning. 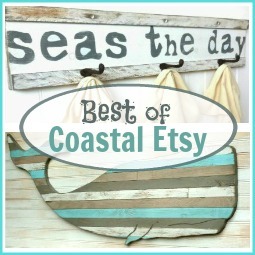 Featured on Decorative Flip Flop Craft Ideas. 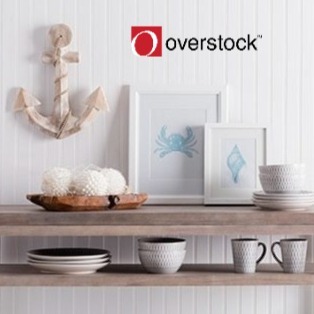 Original source no longer available. 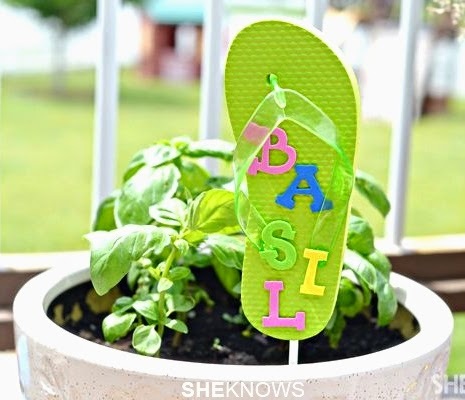 Or a flip flop marker for your herbs! 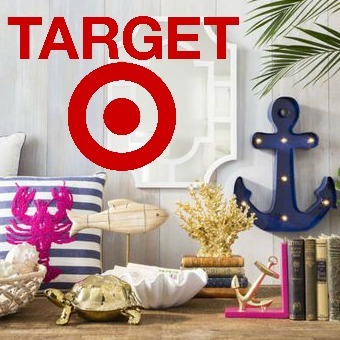 Seen at She Knows. 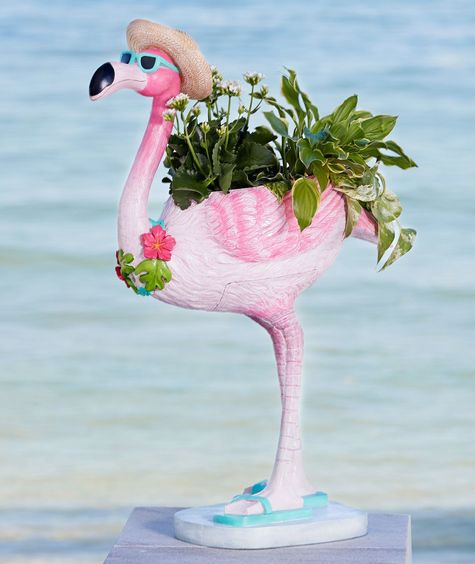 Whimsical Flamingo Garden Planter from Brylane Home, and Flamingo Planters at Wayfair. 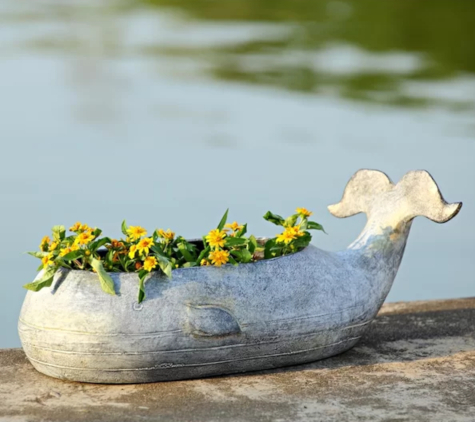 Aluminum Whale Planter from Wayfair's Animal Planter Collection. 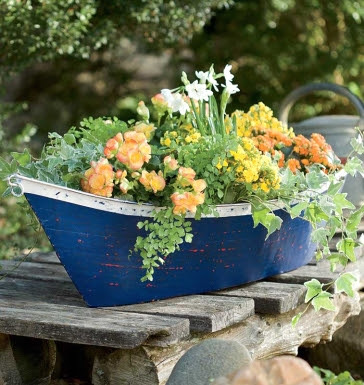 Metal Boat Planters that can sit anywhere. 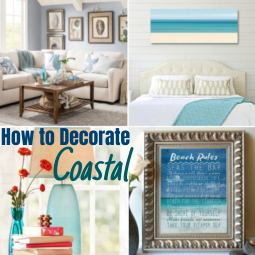 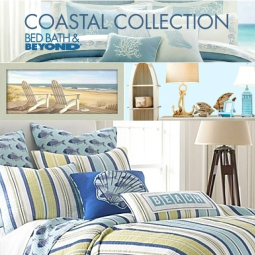 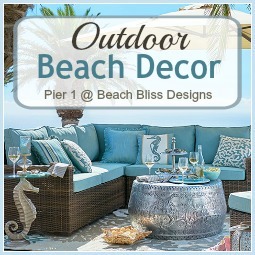 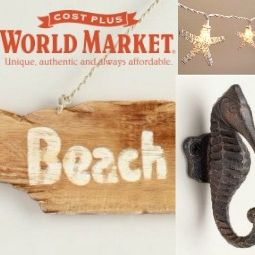 Also featured on eatured Outdoor Summer Beach Decor Ideas. 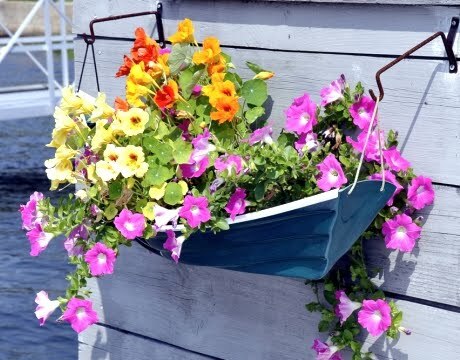 Awesome Boat Planters for the Wall, made with flat backside. 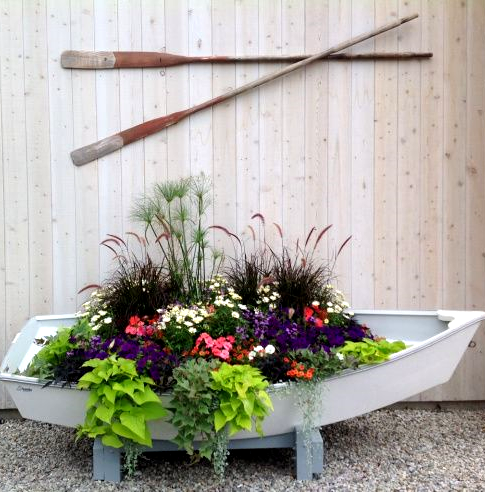 Bring a Boat to your Backyard, seen at Carolyn's Shade Gardens. 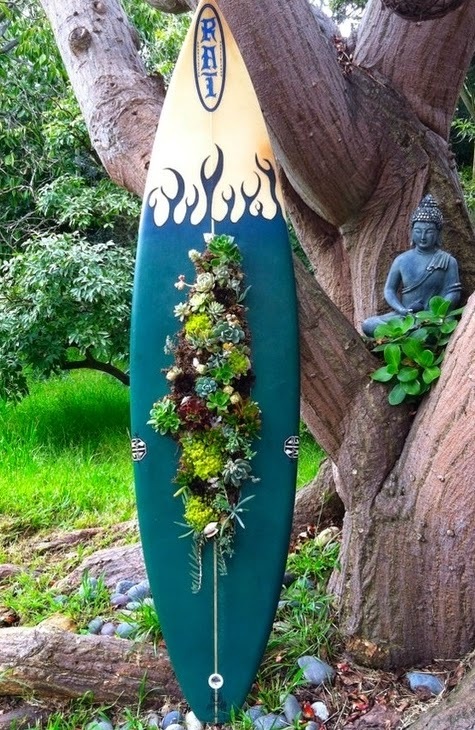 Create a vertical surfboard garden. 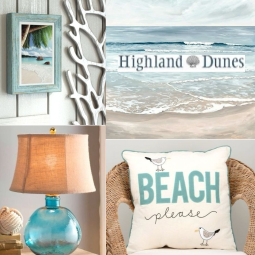 Via Pinterest. 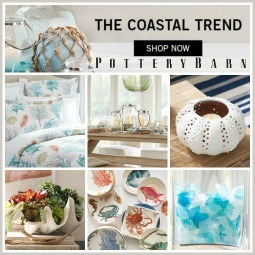 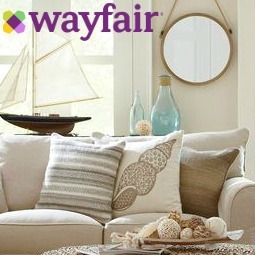 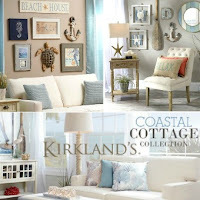 Adorable small Shore & Sea Life Garden Planters from Wayfair. 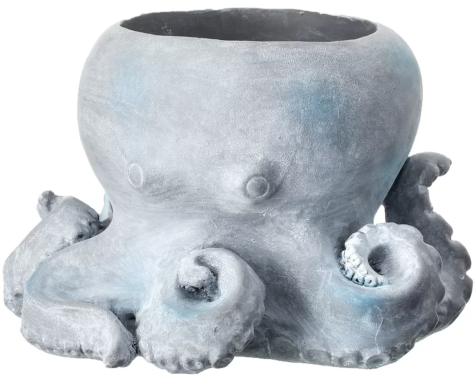 Fun and unique Octopus garden planter sold at Kirklands & Wayfair. 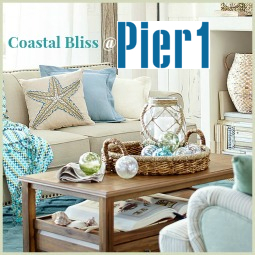 Coastal planters bring a unique feature to your garden, porch, balcony, or Front Door. 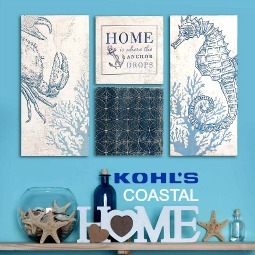 Some also work indoors and can be places on a sill or the floor.